It’s also interesting tour package. 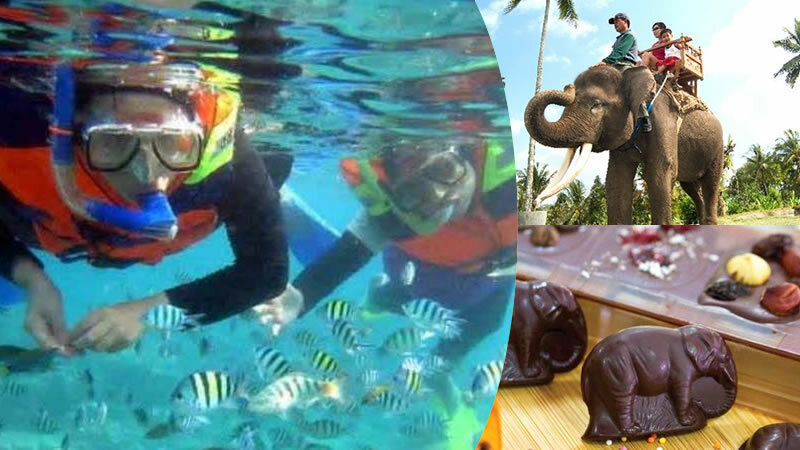 Tanjung Benoa Snorkeling with Bali Elephant Ride + Pod Chocolate Tour is exclusive water sport tour package where you will enjoy two adventures in the same day. First, doing excellent snorkeling activity at Tanjung Benoa beach, and second join an incredible Bali elephant ride for 30 minutes. Next, you will be invited to join on Pod Chocolate tour at Bali Elephant Camp ground. This combination package tour will give you unique experience during your marine water sport in Tanjung Benoa Bali. Don’t miss it and book your full day tour only with us. 14.30 – Visit Bali Elephant Camp for 30 minutes elephant ride pass natural surrounding. 16.00 – Join on Pod Chocolate tour at Bali Elephant Camp ground. Ticket for Pod Chocolate Class tour at Bali Elephant Camp ground.